The introduction of archive mailboxes is one of the major new features offered by Exchange 2010. Matters are substantially improved in Exchange 2010 SP1 as it supports the separation of a user’s primary mailbox and their archive mailbox across different databases, giving administrators the ability to consider schemes such as dedicated archive databases or even dedicated archive servers. Office 365 then offers the prospect of allowing users to maintain their archive mailboxes “in the cloud”. In this scenario, the primary mailbox will be located in a database running on an “on-premise” server and the user will connect to a database running on a server in a Microsoft datacenter whenever they want to access the contents of their archive. All of this depends on the deployment of Exchange 2010 SP1 as the basic platform for Exchange Online within Office 365; this work is ongoing and Office 365 is currently in beta. See this EHLO post for some information on how this setup works. Of course, you need a client that knows about archive mailboxes before you can use the feature. Outlook 2010/2013 and Outlook Web App (OWA) 2010 are clients that Microsoft has purpose-built to exploit archive mailboxes and the other compliance features supported by Exchange 2010, but it’s a pain (and expensive) to have to deploy new Outlook clients just to be able to use an archive mailbox. The cumulative update for Outlook 2007 SP2 helps by providing the code that Outlook needs to be able to recognize that an Exchange 2010 mailbox has been enabled with an archive and to then open the archive. Unfortunately the code is incomplete insofar as it doesn’t round out the scenario by providing the ability for users to manipulate archive tags. I guess the impact on the Outlook user interface would have been too large to have the work done for an update. “Large” in this context meaning that Microsoft would have had to change too much code to add all the bits necessary to reveal and manipulate archive tags. Once you start to make extensive code changes, you increase the engineering and testing cost dramatically and create all sorts of other issues such as the requirement for internationalization and translation into all of the languages supported by Outlook 2007. The upshot is that if you want to access archive (and retention) tags then you have to use Outlook 2010/2013 or OWA 2010. Assuming that you’ve got the right clients and you’re running Exchange 2010 SP1 (or later), all should be well and you can start to enable user mailboxes with archives just as soon as you have moved them to an Exchange 2010 server (and remembered that you need enterprise client access licences or CALs because archives are an extended feature not covered by the standard CAL). But here’s the rub. Enabling a mailbox to have an archive takes a matter of seconds, or even less if you have an EMS session open and are fast to type and run the Enable-Mailbox -Archive command. It’s the consequences of enabling an archive of which so few administrators are aware. In a nutshell, by enabling a mailbox to have an archive, you stamp the mailbox with Exchange’s default archive and retention policy and you deliver the mailbox into the jaws of the Managed Folder Assistant (MFA). MFA is an invaluable ally for administrators when it is well understood and used correctly. The problem with MFA is that it can have an unexpected (and unwelcome) effect on user mailboxes after a retention policy is applied. Sometimes administrators want this to happen, as in the case of a well-planned campaign to “help” users control the sprawl of their mailboxes through the deployment of retention policies and tags. But in this case, you’ve just told MFA that you want it to process the newly-enabled mailbox and apply the set of archive tags that Microsoft has thoughtfully included in the “Default Archive and Retention Policy” that the installation of Exchange 2010 SP1 adds to every organization. You can see the policy listed by EMC in the screen shot below. In fact, there are two policies used by archive mailboxes listed here. The other (Default Archive Policy) is an older version used by Exchange 2010 RTM. It is retained after the installation of SP1 but is no longer applied to mailboxes after they are enabled with an archive. In the screen shot show below, you can see that a mailbox that is not enabled with a archive does not have a retention policy. However, once we run Enable-Mailbox to assign an archive to the mailbox, Exchange fills in a number of relevant properties including the GUID that links the default mailbox to the archive. We can also see that the Default Archive and Retention Policy has been assigned to the mailbox. MFA will do its business very effectively the next time the newly-enabled mailbox appears in its list. The MFA in current versions of Exchange operates on a daily workcycle basis that aims to process every mailbox in a database at least once daily. This means that the newly-enabled mailbox will be discovered and processed by MFA within one day of the archive being enabled. When MFA processes a mailbox, it checks items in the mailbox to see if they have been stamped with the appropriate tags. Retention and archive tags can be applied to individual items. folders, or even conversations. And then you have the magic of a default tag, which is applied to any item in a mailbox that is under the control of no other more specific tag. Of course, your newly-enabled mailbox has never been processed by MFA and the mailbox owner is highly unlikely to have ever applied specific tags to items, so the net effect is that the default archive tag becomes all-powerful and MFA will merrily stamp it on all and sundry within the mailbox. If we look at the tags included in the Default Archive and Retention Policy, we can see that the default tag (the one that “applies to all other folders”) is called “Default 2 year move to archive” (shown above). The action specified in this tag tells MFA to move items into the archive mailbox when they are two years old. The user won’t notice that this has happened if their mailbox is new and no item is more than two years old. They might not notice for other reasons – boredom, lack of attention, devotion to controlled substances, or whatever… but if a mailbox is more than two years old and the user keeps reasonable tabs on what it contains, they’ll probably notice that items have started to disappear as MFA processes them, discovers that they are more than two years old, and promptly moves them into the archive. Of course, “disappear” is a very emotional word and it’s somewhat inaccurate in this context. The items have disappeared from the primary mailbox but MFA has stored them quite safely in the user’s archive. At the end of the day, the user gets a nicely cleaned mailbox and a populated archive and all is well if that’s what the user wanted and expected. The situation is less happy if the user panics because they think they have lost data and the help desk is unaware of what happens when archives are enabled (maybe you forgot to tell them). Loud words and swearing ensues and no one is happy. The moral of the story is that archives are good provided that they are deployed with care, attention to detail, and with due warning to all concerned. Update: See my latest note on retention policies and some changes that Microsoft has made in their interpretation of what you can do with the default MRM policy. Also, it’s worth noting that Office 365 automatically enables the default MRM policy for new mailboxes when they are created – no archive is created, so the archive tags are ignored and only implemented if an archive is subsequently enabled. Update: Exchange 2010 SP2 RU4 introduces the ability for the Managed Folder Assistant to process calendar and task items for the first time. So after you update to Exchange 2010 SP2 RU4 or later, you run the risk that users will see their calendar and tasks folders cleaned out, which isn’t nice. Pay attention to the advice in the article to disable this behavior until you’re ready to unleash the full power of the Managed Folder Assistant. Note that no client exists – even Outlook 2013 – that allows users to manipulate retention policies for the calendar and task folders. The UI simply doesn’t exist. For those running Exchange 2013, exactly the same degree of care has to be taken when you enable an archive mailbox and so automatically apply the default retention and archive policy. There is a small difference in that Exchange 2013 calls its default retention policy the “Default MRM Policy” but it has the same effect on mailboxes when applied. For more information about points that need to be considered for a successful deployment of Exchange 2010 archives plus the workings of the MFA, see chapter 15 in Microsoft Exchange Server 2010 Inside Out , also available at Amazon.co.uk . The book is also available in a Kindle edition . Other e-book formats for the book are available from the O’Reilly web site. The topic of retention policies and tags is also covered in chapter 11 of Exchange 2013 Inside Out: Mailbox and High Availability. This entry was posted in Exchange, Exchange 2010, Exchange 2013, Outlook, Outlook 2013 and tagged Archive mailboxes, Default MRM policy, Enable-Mailbox, Exchange 2010, Exchange 2010 SP1, Exchange 2010 SP2 RU4, Exchange 2013, Exchange Online, Managed Folder Assistant, MFA, Office 365, Outlook 2007 SP2, Outlook 2010, Outlook 2013, Outlook Web App, OWA, retention policies. Bookmark the permalink. Another very useful article and certainly drives home the need to consider retention and archive policies before “switching-on” archive mailboxes. I’m sure a number of organisations are still using Outlook 2003 and a fudge / workaround maybe to create a new folder in every mailbox called archive and set the folder to use the web page option. The web page can then be crafted to connect directly to the users archive mailbox via OWA. Great Tony. You are the boss. Thanks. As always, a very readable, useful discussion of the topic! There are quite a number of companies deciding that though the archiving feature in Exchange 2010 isn’t as functional as a full-bore archiving product, it is good enough to decide to retire their exiting archiving solution. We are contacted regularly from companies migrating to Exchange 2010 and inquiring about using our product to restore all Enterprise Vault archived items back to Exchange either before or after they move their mailboxes. Thanks Dave… I’ve met quite a number of companies who have started to wonder how they can get off Enterprise Vault and move away from the “scrape and stub” approach to use online archive mailboxes. I’ll pass your information on to them to add to the mix of solutions that they can consider during their projects. Very helpful, but does anyone know how to setup a retention policy for the AUTO Archieve now? I don’t want stuff sitting in there forever and dont’ want a quota. I want MFA to clean out that folder as well after 2 years. Do you mean a folder called Auto Archive or the folders in the archive mailbox? Tony, I have your book on Exchange 2010, and I’ve studied articles in Technet and elsewhere, and I think I have a handle on Retention Tags/Policies, but I’m running into some unexpected behavior. I’ve designed a policy for my organization consisting of a default policy tag that moves items in “all other folders” into the online archive. I’ve also set up specific retention tags for various system folders such as Notes and RSS feeds to prevent archiving these folders. It seems like the default policy tag has priority over other things though, because my RSS feeds and Notes will archive. The only way to prevent it is to remove the default policy tag (not really possible if I want to enforce archiving) or apply a personal policy tag, as the end-user, to prevent archiving these specific folders. I’m running Exchange 2010 SP1. So what am I doing wrong? Does your policy contain all the retention tags that you require? You’ll need the explicit folder tags for the RSS Feeds and Notes folders and the default policy tag for everything else (plus whatever personal tags you want users to have access to). The default policy tag only kicks in if no explicit tag has been assigned to an item or inherited by an item, so it should be possible to get this stuff to work. Maybe you can post the details of the policy that you’re using? I have a pair of default policy tags. One tag moves items to the archive after 3 months. The second tag is a retention tag that says delete items after 5 years. Then I have some explicit tags for the folders like notes. Finally, I created a bunch of personal tags that users can use to override my defaults as needed. Not sure of the Best Powershell command synatax to dump my policy/tags in a meaninful way here, but here’s a simple dump of my tag names tiied to the policy. Once again, if I don’t apply a personal tag to Notes or Feeds, they end up getting archived. How do retention tags impact the online archive? Would my 5 year DPT cause items to fall out of the online archive? You say that you have two default policy tags – but a retention policy can only have one default tag… so what is the default tag used in the retention policy that you’re having problems with? Remember that the Managed Folder Assistant (MFA) processes on a mailbox basis. As the MFA opens a mailbox, it examines the retention policy assigned to that mailbox and then implements the tags in the policy. So if you have a mailbox with a retention policy that includes a default tag that moves everything to the archive after 3 months, MFA will move any item to the archive after 3 months unless an item is covered by a more explicit tag such as one assigned to a folder or a personal tag placed on an item, folder, or conversation by a user. Tony, thanks very much for your prompt replies. In your book you mention that you can have two DPTs in a policy. Table 15-2, page 991 describes how you can set up one DPT for a shorter retention period to archive and then set a second tag for a longer period that deletes. My thinking was to move things to the archive in 3 months but then set a retention period for 4 years. It wasn’t clear to me, but I’d wondered if retention tags apply to the online archive too. Thus the 4 year DPT would delete mail from the archive 4 years later if it did. Anyway, that is my secondary issue. My primary concern is why does Notes/RSS feeds archive even though I do have retention tags in my policy for those folders set to never delete or archive? Only personal tags, applied by the end-user, seem to prevent Notes or Feeds from archiving. I see where some confusion might arise. You can have one default retention tag and one default archive tag in each retention policy (actually, Exchange 2010 SP1 updates this if you use UM as you can then have a separate default retention tag to control how voicemail messages are processed). The retention tag determines the default retention period for items in the mailbox, the archive tag sets a time when they will be archived. The default retention tag applies to items in the archive mailbox as well – there isn’t a separate retention policy defined for the archive. Obviously, a default archive tag only works when a mailbox has an associated archive. Your plan of having one DPT that moves items to the archive after 3 months and then another (the delete DPT) to delete them from the archive after 4 years is absolutely supported. Tony, I actually had seen that technet article. Between that and your book, I thought I had a very solid undertanding. I think there are others in the same boat though. I found the following thread on this issue and posted my own comment there. Also see the EHLO blog post at http://blogs.technet.com/b/exchange/archive/2011/08/05/prevent-archiving-of-items-in-a-default-folder-in-exchange-2010.aspx (just posted). The blog post you linked me to says it all. Thanks so much for looking into this!! one question: If one doesn’t like the default beahvior and wants all mailboxes with new archivs to keep the content forever if not other spezified – what would be the best way to archive this? Should one delete/disable all Tags out of the “Default Archive policy” or should one crate a new policy and make this (if possible) the new default policy? I’d create a new retention policy with archive tags that do whatever you need (for example, keep items in the primary mailbox for 25 years) and assign that policy to new mailboxes. Thanks for your very quick answer – but in that case you manually have to assign that 25 year policy. Is there a way to give it automatically to all new ceated archives? 1. Assign the policy manually when you create a mailbox. This can be done through either EMC or EMS. 2. Assign the policy afterwards by running a scan to discover mailboxes that have the default retention policy assigned and then update these mailboxes with the new policy. 3. If you use a script to create new mailboxes, update it to make sure that the right policy is assigned. 4. Use a cmdlet extension agent (new feature of Exchange 2010) to run code to assign the policy after the New-Mailbox cmdlet is successfully executed. Deleted Items – 7 days delete. User generated folders – 180 days but users may select a longer retention period such as 365 days. We would also like an archive tag that a user could set to move the items to the online archive and be retained for an extended period of time such as 3 years. Or manually moving the items to the archive. The first part of the equation is simple enough to setup if we were only concerned with the retention policy and not the archive. We would create a default retention policy of 180 days, then set an explicit retention tag on the Deleted Items for 7 days. Followed by a Folder retention policy set to 180 days. The part I am struggling with is when we put the online archive into the mix. Is there really no way to set a different retention period on the online archive items? Would you have any possible suggestions to solve our problem? I know we could set a quota on the archive, and that might be an approach we might have to take, but ideally we would want to age the items to keep the archive from growing very large. As we all know once it sits in the archive the users will rarely look at it again, thus never have an incentive to clean up the mailbox archive. Thanks for your time…and many years of terrific books and knowledge!!! Such a policy will keep the mailbox reasonably clean – items will move to the archive after 180 days unless they are either explicitly deleted or tagged to remain for 365 days. They’ll stay in the archive until they expire after 2 years. Thanks Tony. That makes perfect sense. It would be nice in a future version of MRM to allow that flexibility to have a separate retention policy on the overall archive. This would then be on the end user to move items to their own folders in order to retain the messages for a longer period of time. Those messages would then be moved to the archive after 6 months and retained for 2 years. I appreciate your quick response and your extensive knowledge on Exchange. I have been in awe of you for many years. You have set the bar very high for us Exchange guys/gals! Take care. Sorry, I do have one other question that I have on this. We also plan on pulling in the PST files into the online archive at some point. Is there a way to stamp a retention tag on these imported items as they are imported? Or will the default retention tag be stamped on the items imported? 1. Have the user create a folder called “PSTData” in the online archive. 3. Then specify the “-targetrootfolder PSTData” when importing in the PST data. Any other creative ideas around this request? New items that are created in a mailbox or are imported will be stamped by MFA with whatever tag is appropriate based on where they are located in the mailbox. In other words, if they go into a default folder that has a tag defined, that tag is inherited by the new items. If a personal tag has been assigned to a folder, that tag is picked up. If no explicit tag is assigned, the default tag is used. You might be best to create a folder as you describe and assign a personal tag to it to keep the items for a longer period. Then create all the folders from the PST as sub-folders underneath. They should inherit the personal tag and be retained for the desired period. I have run into a couple scenarios I want to make sure I have an answer on before I finalize my plan. If we setup a policy as I have described in the previous posts. Question#1 – Does the default retention policy apply to Calendar, Tasks, Contacts, Notes? Question#2 – Does the default archive policy apply to those folders as well? My concern would be that the “Contacts” would first get moved into the archive and out of the main mailbox, and second removed after the 2 years. This would create confusion for users, not to mention many of our users are using ActiveSync, and would no longer have their contacts after the items were either deleted or archived. I have scoured the TechNet articles, blogs, etc. to find out which default folders are included in the “All other folders” grouping. It seems that some say that these folders I have described are not included. Then others say a different set of folders are included. I also know that there was a change in SP1 to which folders are included or are allowed to be setup using an explicit policy tag. Can you provide a source of truth on this for me? I did read that “Notes” seems to be an issue described as exhibiting the behavior I do not want to occur for our Contacts, Calendar, or Tasks. The workaround is to either turn off the default archive policy, or to have the users mark the folders as to not archive. Do you know if SP2 will be bringing any changes to the policies? 1. Does the default retention policy tag apply to Calendar, Tasks, Contacts, and Notes. The answer is yes for Notes but not for Contacts, Calendar, and Tasks which don’t support retention tags. As you point out, it would be a bad thing if objects such as Contacts (which are often timeless objects in terms of the desire of the user to keep them for ever) were removed after 2 years. 2. Does the default archive retention tag apply to these folders? The answer is yes for Calendar, Tasks, and Notes but again not for Contacts. The same logic applies. I don’t know of any changes in this area in SP2. Then again, no one will know until Microsoft releases SP2. In the meantime, http://blogs.technet.com/b/exchange/archive/2011/08/05/prevent-archiving-of-items-in-a-default-folder-in-exchange-2010.aspx also provides some valuable background. I have our policy tags/retention policy locked down and ready to go, but I am running into problems trying to setup the policy tag for the Calendar. I read the part in your book about having to create this using EMS, however when I attempt to set it up I am getting the error listed below. I have also included the syntax I was using when I got the error. We are running SP1 RU4-V2. I have tried this in our production environment as well as lab environment and it is a no-go. Is it possible they removed this capability in a rollup pack since you published your book? Tags of type Calendar or Task are not supported. Ooops… Microsoft might well have closed the gap that I described in the book in a roll-up release. I can’t test this because all my servers are running a new build of a version that I can’t talk about. This just goes to prove once again that writing about technology is prone to be bypassed over time. In some respects, it’s a fool’s errand. Sorry! Nothing to apologize for Tony. You have been more than helpful on this topic/thread. Many thanks for taking the time to respond to me and the Exchange community. great post and most informative. we have an Exchange 2010 server in hosted mode and we have migrated a number of customers mailboxes to it. Some now require archiving but as far as the server goes their imported emails are only as old as the day they were imported . How can we tag some of the older emails with their proper date and npt the date they were imported? Create a personal tag and give it a retention period of x (the number of days for which you want to retain the items) – y (the number of days old that the items were when they were imported) and then apply that tag to the items? For example, if you want to keep items for 2 years (730 days) and the items were already a year old when they were imported, create a tag called “Adjusted 2 years after Import” with a retention period of 365 days and apply that tag to the target items. Or create a folder and move all the items to it and apply a suitable tag to that folder? I mistakenly deleted the Personal Tag, Never Move to Archive. Is there a way to recreate this tag? Yes, just create a new Personal Tag called “Never Move to Archive” and add it to the default archive and retention policy. I am away from servers at the moment and can’t check the exact parameters but I am sure that someone can do a Get-RetentionPolicyTag -id “Never Move to Archive” | FL and post the result here – or I will when I get back on the ground and have a chance to look. Hi Tony, Great stuff on here.. I’ve scanned all the comments and I am having a somewhat simple problem that I am unable to get to the source of the cause. I created a bunch of personal tags for moving to online archive. Basically our users wanted a bunch of choices to set for different folder. The MS defaults of only providing 2 or 1 year options only were not acceptable. Users wanted to assigned different move to archive ranges to different folders.. Like for the sent folder most wanted to set that folder to move to archive anything older then 30 days or 3 months but on their inbox they typically set it to 6 months or a year. So I create a bunch of move to archive personal folder tags in the Exchange console at the org level. I then go into the Default archive and retention policy and add these tags. I then run the shell command that makes these tags now visible from the users Outlook 2010 Sp1 clients. 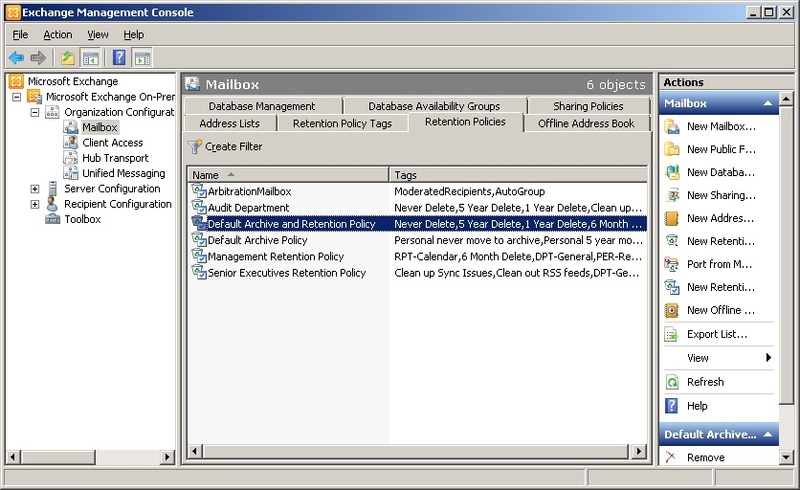 User go into their outlook and now can see new archive policies available to them. SO everything is GOOD so far. Now they right mouse click on their sent folder, go properties, then policy tab, then under the online archive section they pick the drop down and change from “use parent folder policy” to the new 30 day policy I created. They hit apply. we close outlook come back in and look at that policy and it is still saying 30day for sent folder. Now here’s where we get to the problem!! We look at that users sent folder archive policy and some how it is reset to “use parent folder policy”.. HUH? SO we experiment again and set numerous users archive policies to one of my custom ones.. Wait one day and once again everyones folder has been reset to “use parent folder policy” yet again.. So something is running on the server that is toggling every ones folders right back to the default 2 year move to archive policy?? I don’t understand this at all. MS clearly states the default policy is only applied when no explicit tag is set. We are applying explicit tags and they are getting toggle right back off every night.. You have any insight on this?? Just wondering, is there a folder retention policy set on the Sent Items folder? It’s kind of hard to know what’s going on without seeing the full details of the retention policy and tags that you’re trying to use and then replicating the situation. I’ve set no retention policy at all other then enabling the online archive DBs for a specific set of users. Those obviously got set with the default policies at the time which is just the out of the box anything older then 2 years gets put to online archive. That is indeed working in that all these users had stuff moved down to the online archive anything that was older then 2 years.. We just cant seem to get any of our own personal tags to stick to any folder. We set them only to find the next day they are undone. Doesn’t matter what folder we apply them to they all get undone.. This comment section doesn’t seem to allow for attachments or I would upload any screen shots you would like to see. I’m a little baffled by all this cause looking at the documentation and what is going on this should work..
Aha. I think I understand what’s happening. Retention policy tags RPTs apply retention settings to default folders such as the Inbox, Deleted Items, and Sent Items. Mailbox items in a default folder that have an RPT applied inherit the folder’s tag. Users can’t apply or change an RPT applied to a default folder, but they can apply a different tag to the items in a default folder. In other words, you can apply a personal tag to items in a default folder like Sent Items, but you cannot apply a personal tag to the folder. Personal tags Personal tags are available to Outlook 2010 and Outlook Web App users as part of their retention policy. Users can apply personal tags to folders they create or to individual items, even if those items already have a different tag applied. Note the “to folders they create or to individual items..” Again, Sent Items is a default folder so it is dealt with through a retention policy tag that is inherited by items held in the folder unless those items are stamped with a personal tag. So, if you select all the items in Sent Items and apply the personal tag it will work but if you apply the personal tag to the Sent Items folder, the MFA will “undo” the client-side operation performed with Outlook 2010 or OWA and restore the retention policy tag for Sent Items the next time it processes the mailbox. But I do appreciate you figuring this out,. This completely explains it, but why don’t they update the technet library user documentation of retention policies to reflect this?? Also if this was not MS’s intent my biggest issue is why do these folders have policy tabs that let you actually make changes?? Another stupid thing.. If users are not allowed to change the Sent or inbox folder online archive policy settings then why does outlook 2010 allow the user to think they can?? I sure hope SP2 addresses some of these things.. What looked like an awesome feature is looking more disappointing by the day.. Thanks for your help Tony at least I know I am not imagining things now…and that there is some logical explanation for what we are seeing..
Actually, Microsoft has documented this on TechNet. The page that I cited is from TechNet. It’s just that retention policies and tags are somewhat misunderstood often and need a little thinking through to figure out how they can best be used within a company. Like all implementations there will be good and bad things to cope with and again, like all IT, you need user training to make the software as effective as possible. Remember that not all items in Sent Items are likely to be ultra-important. It’s actually good discipline for users to either move essential items that they want to keep to a different folder (stamped with an appropriate personal tag) or to select individual items and stamp them with the right tag. Otherwise you end up with a whole pile of crap being kept around forever. I can’t account for Outlook’s behavior. Then again, I never could. Sorry I misspoke.. MS did put this info into their technet documentation on the subject..
Running into an interersting one with one of my users. Every morning, he finds a bunch of his 6 month old email moved from his Inbox to Deleted Items. He has an online archive and our standard archive/retention policy applied to his mailbox. Nobody else has reported this kind of thing so far. I don’t believe there is anything in the policy that would do this. He has no client-based rules. I have moved all his messages back and then manually started the managed folder assistant to see if it is the culprit, but nothing deletes again. Yet the next morning, the stuff ends up right back there again. He has other stuff about the same vintage correctly moving into his online archive mailbox. He is also a BlackBerry user (via BES). So we have a whole variety of processes that could be impacting his mailbox including BES, archiving/policy, user rules, perhaps even a another person who has access to his mailbox, and who knows what else. Is there a way to audit his mailbox to determine what process might be responsible for moving mail to Deleted Items? I don’t think that the mailbox auditing features introduced in Exchange 2010 will track the processing done by the MFA. Neither do I know of a way to have the MFA log each and every action that it takes. I think it’s back to detective work to figure out what’s going on here. Have you looked (with Outlook 2010 or OWA) at the retention tag that’s on the items that get moved? You should see this in the header if a retention tag is applied through the folder or placed directly by the user. Default tags won’t show up. It might be possible that the user has played around with Policies and put a six month policy on the Inbox so that all items in the Inbox then come under that policy. We still use Outlook 2007. I checked via OWA. He has the folder default policies applied to Inbox. In fact, he hasn’t applied any of his own tags on any folders. OK, if you’re using Outlook 2007 there’s no way that a user can mess around with policies simply because they can’t view them. So there’s got to be something that is specific to that mailbox. Are these messages that were imported from somewhere so that their delivery date is such that MFA considers them candidates to be archived? There’s got to be something happening that has forced MFA to treat these items differently than those in another mailbox. Here’s another interesting curiosity. Some of the messages winding up in the deleted items are also being archived into the online archive deleted items. I’m curious about what the MFA uses as the date. You said delivery date. In the past with I know that auto-archiving to PST’s used the modified date. This always led to user confusion. Say you did a mailbox move or import. This could throw off the modified date. The modified date is normally hidden from view further confusing users. When items are moved from folders with Retention Policy Tags (RPTs) or a Default Policy Tag (DPT) on them to the Deleted Items folder their retention Start Date is not re-evaluated and the original Start Date that the Managed Folder Assistant (MFA) stamped on the item is retained. This means that it is possible for items that have been moved to Deleted Items could be expired/deleted immediately the next time the MFA scans the folder. However, this does not affect items moved to the Deleted Items folder from folders without RPTs or a DPT. In other words, if no RPT or DPT controls an item or you apply a personal tag to an item or it inherits that tag from a folder, the MFA evaluates the retention start date then. 1. Item comes into Inbox on 1/24/2010 and Inbox has a DPT of 1095 days. The item is stamped by the MFA with a Start Date of 1/24/2010. 2. The item is deleted by a user on 3/15/2010 and moved to Deleted Items, which has a RPT of 30 days on it. The Start Date remains at 1/24/2010 because moves to DI don’t re-evaluate/change the Start Date. 3. MFA comes around and scans the mailbox, sees the item in Deleted Items with a Start Date of 1/24. 4. Since 1/24 is >30 days it deletes the item. 1. Item comes into Inbox on 1/24/2010 and Inbox has no RPT/DPT. No Start Date is stamped, Start Date remains $Null. 2. The item is deleted by a user on 3/15/2010 and moved to Deleted Items, which has a RPT of 30 days on it. The Start Date remains $Null because moves to DI don’t re-evaluate/change the Start Date. 3. MFA comes around and scans the mailbox, sees the item in Deleted Items with a Start Date of $Null so it uses “Present Date + RPT” instead. 4. Item has an expiration date of 3/15 + 30 days stamped on it. 5. Once MFA scan the mailbox on the 30th day after 3/15, it deletes the item from DI. It was definitely related to the MFA. I could recover the messages and watch them go away as I restarted the MFA. I took out the 10 year DPT, and items stopped deleting when I started the MFA. My workaround, will have to be leaving that tag out of the policy. They’ll have to do their own deleting. Somehow the 10 year retention DPT was conflicting or confusing with the 6 month archive DPT. Of the two, the archive policy is far more important. I’ll live with this, but the whole thing is a real curiosity. Aha… but your 6 month archive DPT would surely always have precedence over a 10 year retention (I assume delete) DPT. When MFA processes the items, it sees that there is a policy that calls for an action after an item is six months old. In this case, it’s the archive DPT. The retention DPT will be actioned after 10 years – but the item will be in the archive mailbox. But this doesn’t gell with your previous statement that the items are being deleted after six months. So what’s happening – were the items being archived or moved into Deleted Items after six months? Six month old items were not archiving. They were moving to the deleted area. Very strange. You are correct that my 10 year DPT was to delete. It seems like those two tags were somehow confusing. I’m having a problem in that 2 users who have had archiving enabled seem to be missing emails in their active inbox (earliest they currently have is Dec 2010) and in their archive mailbox there are NO emails. These users have been with the company since 2005 and they definitely have emails in other folders in their archive dating back since 2005. No new tags or the policies have been changed at all. Other users who have had archiving enabled have not had this issue. Any ideas? No ideas… it’s kind of hard to debug this kind of issue through blog comments. If you think that the problem is real (in other words, the users aren’t simply confused), then I would report it as a support problem to Microsoft. Hi Tony, I want to “turn on” journalling for our production Exchange 2010 environment for compliance reasons capturing every email sent and received. I also want to establish archiving for our production Exchange. You don’t say where you intend to journal messages. Assuming that you journal to a mailbox, you could have a retention policy applied to that mailbox which moves every item from the inbox to an archive mailbox daily. I’d keep this archive mailbox (and perhaps the journal mailbox) on a separate database and make sure that appropriate quotas are set up to make sure that everything can be captured. I’d also test the setup to make sure that it does what you want it to do. I always read your blog with interest Tony; but this time i have a query. We imported a couple hundred users into Exchange 2010 SP1 with Online Archiving enabled. The users after migration will only use OWA2010. Turns out when you look at OWA the migrated calendars and contacts do not appear. Log into a full Outlook client and they show up in the Online Archive as planned. If you drag and drop/copy the Contacts into the Main Mailbox Contacts or Calendars directory…the data appears in OWA. Do you know of a way to get the migrated Calendars and Contacts directory OUT of the Online Archive and INTO the Main Mailbox…for OWA use? I don’t want to have to do this for 250 mailboxes…! The interesting thing here is to ask why the calendar and contacts items have ended up in the archive. How did you import the mailboxes into Exchange 2010? Was it with the Exchange move mailbox function or some other tool? If the latter, then I wonder if it stamped the calendar and contact items in such a way that the Managed Folder Assistant then decided that they should be archived (the MFA operates on these mailboxes because they are archived-enabled and so have the automatic default archive and retention policy assigned). Something has caused the calendar and contact items to be archived and I really think you have to figure out why before you a) move other mailboxes and b) attempt to rectify the existing issue. I sense a visit to Glen Scales’s EWS-centric blog is in your future. Thx for the reply…this was a Lotus Notes to Exchange 2010 SP1 migration. Due to legal reasons this migration was *completely* offline with no touching of the Source environment. I’ve done many Quest migrations and the default choice was Quest Notes Migrator for Exchange. Take an NSF/export to PST/Import to Exchange Online archive. However a month after QNME purchase and several WebEx with their Support people, we confirmed we had encountered a bug in the product (code tries to call Source AD even though none specified). Quest issued a CR for a bug fix in the week leading up to Christmas…when all of our testing was supposed to be taking place. This meant we frantically had to look around for a new tool while the bug fix was provided. (We only got that bug fix last week…too late for our migration which HAD to happen on a certain date – US acquisition). While I was on Honeymoon, the SysTools NSF to PST Converter product was purchased: quick and dirty but worked perfect in terms of actual conversion of data. The issue we did not forsee was the importing of PSTs to the Exchange 2010 Online Archive. As you say “…why did you import with the -ISArchive flag…”…well we had no choice…some users had 20GB+ NSF mailboxes… depending on the item count and complexity some of these ballooned to over 30GB. Try downloading that Cached mailbox – they always had to go into the Archive. The crucial point is that a last minute decision was made to drop the full Outlook client after protest and give these migrating users OWA only. At that stage we had no idea that the Calendar/Contacts would not be accessible via OWA within the Archive and the clock was ticking. I’ve got in touch with Glen, will post back if he has any ideas which would do exactly as you suggested via EWS. This would all be a non-issue if the full Outlook client was in use…! I sense another 15 hour day today. are using OWA and not the full client for at least another month. Oh wow… but at least you know what happened. I hope that Glen can help you. We ended up getting things working using the following PowerShell. Basically Export/Import to pull the data out and then in again. Amusingly Systools converts the ‘Contacts’ folder as “Contact’….all working now though and a few grey hairs added. Advice to anyone employing -IsArchive during migration: compare OWA functionality against Outlook client!!! I am very happy that you found a solution but disappointed that I forgot that exporting and importing the data would do the trick for you. It’s great to be able to think outside the box to find a solution. On the same subject: …is there any logic or mathematical algorithm to speak to that illustrates the efficiency of the Archiving engine? For example if i just pumped 500GB into multiple mailboxes (online archive) and wanted to view it….is there any way to monitor that activity? The archive engine is the same as the primary database. Exchange 2010 includes a lot of work to optimize and speed up database access and Microsoft is looking at databases that function smoothly in the 2TB-4TB space. I don’t think 500GB will pose any problem whatsoever. Database size is really only limited by a) disk size and speed, b) management concerns (backup speed for instance), and c) design preference (for example, spreading load across multiple databases in order to avoid putting all your eggs in one basket). There are tons of PerfMon counters available to monitor the health and effectiveness of a database… all documented in TechNet or books on Exchange 2010. I think you’d need retention tags for the default folders (Inbox and Sent Items in particular) to be sure that the mailbox is cleared out to the archive after a year’s retention. Apart from that, I think you’re on the right track. Not sure that you need the second tag at all… after all, if you just want items to be moved into the archive and stay there, what’s the point of having the second tag that’ disabled and therefore inactive? A set of retention tags (RPTs and DPTs) with a 1-year retention period assembled in a retention policy (different to the default) and assigned to mailboxes should do the job. Just a follow-up for anyone reading this later re my PST import saga.. The actual PowerShell above for PST imports all worked with above PowerShell extracting only Contacts and Calendars….however every single one failed on import The BadItem limit was raised to 10000- but the import flagged every item as Bad. In the end we had to manually open EACH PST in Outlook…and drag and drop the data from one profile to the other. After giving full access to each mailbox in that particular DB. We had a team of guys logging in and dragging/dropping…the data got there in the end. I’m still going to open a support call to understand why each item was flagged as Bad for the import …not sure i’ll get anywhere. Perhaps the conversion tool wrote something against each item…speculation. Now need a vacation to recover! Cheers. You should absolutely open a support call so that the Exchange developers can understand why your items were regarded as bad. In most cases (as far as I understand the matter), it’s because they are “badly-formed MAPI items”. In other words, some of the properties that Exchange expects to be populated for items such as calendar appointments or messages are either incorrectly filled (wrong data) or not filled at all. I’m afraid this is pretty common with some Outlook add-ins of the past and I suspect that the same might be possible for migration tools if they don’t populate all the MAPI properties correctly when they move items from Lotus Notes (or another email system) to Exchange. I’ll open a call and try and get some answers this coming week. If there’s any space left on your blog i’ll post back the final version. For the users who have multiple/old PST, how can I create a policy to move their PST to archive database? Will the default retention policy be affected on that time? I have a manager who would like to keep his PST files in separate folder called “MY Archive”, how can I set a policy to move his data to archive & stay forever there ? You’ll have to use the New-MailboxImportRequest cmdlet to import the old PSTs. This can specify a -TargetRootFolder parameter to instruct Exchange to place the imported PST contents under a specific root, such as “My Archive”. However, any items subsequently moved to the archive by MFA will be put into a folder with the same name as the one they came from in the primary mailbox. And yes, items that are imported into an archive (or primary) mailbox are processed by the MFA and stamped with whatever policy is assigned to the mailbox. This happens the next time MFA processes the mailbox. 2) I applyed an archive policy, then I imported some email items to my inbox. but the policy didn’t move them to archive even they match the criteria ! why did that happened ? how does that work? will this force the items that moved to archive to returend back to user inbox? how does that work? do i have to stop archive policy and then ask the users to move their email items manually from “online-archive” ? MFA runs on a workcycle basis from Exchange 2010 SP1 onwards and should process every mailbox on a server at least once daily. You can always run the Start-ManagedFolderAssistant cmdlet to have MFA process a mailbox immediately. All of the other questions that you pose are well documented in TechNet help – or even in some of the Exchange 2010 books. Have you looked there? I am reading an article dated January 11, 2011 about archiving in Exchange 2010. It has been 13 months and SP2 has also been released. Can you highlight how many of the concerns and points made by you are still relevant? In which areas, things have improved? I thank for your reply. The essential points, that Exchange automatically assigns a policy to mailboxes when an archive is enabled and that there are a limited number of clients that can work with the archive are still valid. There has been no change in behavior and no other clients have gained access to the archive since Outlook 2007 was upgraded. For example, there’s no mobile access still. I am sorry if this has been answered in this string, but I am looking for any help on reverting a user back to the default archive mode with a locally managed archive.pst. I have disable the Archive feature in her mailbox on Exchange 2010 SP1 and now see that her Outlook 2010 profile has removed it as well, but in Outlook, under Cleanup Tools, the Archive option is still missing. How do I revert to the original settings? I’ve tried creating a new profile in her Outlook, but the Archive option is only available for a few seconds before the Archive option disappears again. Help! I know that Exchange informs Outlook about the presence of an online archive mailbox through the AutoDiscover feature. Once Outlook sees that an online archive is available, it can disable the Archive option from its menu. Reversing the process is the difficulty. I assume that it’s a matter of making sure that AutoDiscover doesn’t provide Outlook with whatever information Outlook uses to remove the menu choice. Maybe you can make sure that all of the Archive* properties for the user’s mailbox are nullified (have null values), just in case one of these is the key. Also, is there a retention policy applied to the mailbox that has any archive tags? There are retention policies enable for Archiving, but I was finally able to clear this by using the following command in the EMS: Disable-Mailbox -Identity “User Name” -Archive. I kept trying to do this in the EMC and that didn’t work. Thank you for the extremely prompt reply! Sorry… I thought that you had already disabled the archive from the description that you gave. Interesting that it didn’t work from EMC. I shall let the Exchange people know! I see from your article and some repsonses that they have Online Archives working through various versions of the Outlook client…how? I was under the impression that Online Archives would only show up in Outlook 2010 Pro Plus?? Yes, Pro Plus is required for Outlook 2010, but Microsoft has updated Outlook 2007 so that it can access online archives as well. See the February 2011 cumulative update for Outlook 2007. Will this work with different email clients or is it limited to Outlook 2007/2010? I ask because we have Mac clients running a mix of Entourage & Office Mac 2011, Mac Mail, iPads, iPhones, etc…with mailboxes in the 15GB-40GB range. We also have users on Office 2007, 2010 and Android phones. No ActiveSync clients, including Android phones, can see the archives. We have many users in 25GB+ and often times trying to sync remote causes local database corruption. Your response helped me understand the capabilities and limitations and for our Mac users they will just have to access through OWA for their archives. A side note, Mac Office 11 SP2 caused havoc to us last week, database corruption on the client side, it was syncing so our internet connection was at 100% for 1 week straight…until it was uninstalled from the users’ systems. Now I know why Microsoft pulled SP2 and reintroduced it again this week. Yep, http://www.zdnet.com/blog/microsoft/microsoft-reissues-patched-service-pack-2-for-office-for-mac-2011/12557 reports that Microsoft has shipped SP2 for Outlook 2011 (14.2.1) for Mac with a fix for the database problem that caused them to withdraw the original kit. Hi Tony, great article, I spent most of yesterday afternoon researching the archiving feaures of 2010 but just wanted your advice on the below if possible. I’ve created a retention policy so that all email items older than 90 days are moved to the user’s archive mailbox, to be retained forever. I created a new retention policy with a tag type of “All other folders in the mailbox”, retention 90 days, action “Move to Archive”. I read conflicting articles as to what this actually archives, does this policy cover everything? By that I mean all system and non-system folders? If I also have a “Never Delete” Personal Tag in the retention policy and applied it on my Inbox folder, does that replicate to any sub-folders I’ve created under my inbox? Exchange won’t archive some items. The Calendar and Tasks are the most obvious examples as these are exceptions implemented because users would be probably quite annoyed if their calendar was suddenly denuded and they lost all trace of tasks that they were tracing (both calendar and task items can be quite long-lived). I think everything else will be moved to the archive unless another tag (either a folder tag or a personal tag) stops the MFA processing the item. Something like the “Never Delete” tag that you mention would stop archiving – and if this was applied to a folder, it will be inherited by any sub-folders. Great news, thanks for the reply Tony. Tony, BEWARE is right! It should probably be stressed that companies get the default policy configured correctly before they apply it to any mailbox. The TechNet document “Understanding Retention Tags and Retention Policies” says “When you enable a personal archive for a mailbox, the Default Archive and Retention Policy is automatically applied to the mailbox if it doesn’t already have a retention policy. If you later apply a (different) retention policy to the mailbox, tags from the Default Archive and Retention Policy are no longer available to the mailbox. (However) Existing items that have tags from the Default Archive and Retention Policy applied are still processed and moved to the archive or deleted based on the tag.” Is there any way to replace the tags that were already applied by a default policy? Let’s say a company changes the default policy after it was applied to a mailbox, is there any way to “re-apply” tags to all of the messages that were previously tagged? For example, the “Default 2 year move to archive” tag is removed from the default policy and replaced with a shorter archiving tag. My understanding is that it’s only personal tags that are maintained. Updating a policy with a new default retention tag will force MFA to respect that setting rather than the previous default tag. At least, I think that’s the case… I’ll test it as soon as I get a chance. I think I’ve found the answer to my question in the same article, “However, if you delete the tag, the tag definition stored in Active Directory is removed. This causes the Managed Folder Assistant to process all items in a mailbox and restamp the ones that have the removed tag applied. Depending on the number of mailboxes and messages, this process may significantly consume resources on all Mailbox servers that contain mailboxes with retention policies that include the removed tag.” That being said, in order to replace the 2 year archive tag with the shorter one, we would need to delete the tag. Well, that’s a kind of radical approach because of the processing involved to deal with millions of messages (conceptually) across an organization. Again, I think this might apply to a personal tag. But I will check it out. I checked with the Exchange developers. The best way to enforce a different retention or archive period is to edit an existing tag as that means that MFA will simply use the updated period or action the next time it processes an item. For example, to change a DPT with an archive period of two years for one year, just update the retention period from 2 to 1 years and all is well. Don’t remove a tag and introduce a new one as this causes too much overhead processing. Thank you for obtaining and posting this valuable advise, Tony! Tony, I have a question that i haven’t seen an answer on when scouting the internet in relation to assigning tags and policies. When we went to Exchange 2010, we built our own policy, but used some of the default tags, namely the Default 2 year move to Archive. When we enabled users for archive and assigned a policy, our remote users running cached mode experienced bandwidth issues as their OSTs downloaded new items with updated tags. We are now considering changing that 2 year archive tag to 1 year and are wondering if we will see similar issues for our remote users, or if it will simply remove the items from their cached OST (as Archive is not cached). Any help or guidance would be appreciated. We have not tried the guinea pig approach yet using a new overall policy with similar tags. If you replace the default archive tag for the mailbox (rather than a folder tag or personal tag) by changing the retention period from 2 to 1 years, then I think that the items will be removed from the OST by the MFA after one year and no further restamping of the tag will be necessary. That’s my belief, but I would test it! Thank you for the information Tony! We will give it a try. Tony, thx for the great info. My users have Archive Mailbox enabled. I have a retention tag that sends Inbox and Sent Items into archive mailbox after 90 days. How do I delete the items in the Archived mailbox after 90 days aged? Tony, Is their a way to setup a Retention Policy for the Primary Mailbox so all emails are deleted six months after they are received and then setup the Archive folder to never delete emails and have the user’s manually drag any emails they want to keep to the archive folder. My users can not see the archive folder. What coul be the problem? Can i set it up manualy by configure to connect to exchange? Perhaps they are not using the Professional Plus version of Outlook? You need this version of Outlook 2010 to review archive mailboxes. Or the latest patches for Outlook 2007 Pro Plus. Or they can use web access. They have office 2010 pro. is there any other way to make it possible for them to be able to review thier archive using Outlook? If they have Office Pro Plus then they should be able to see the archives. Maybe this is the problem? http://www.expta.com/2010/04/no-access-to-online-archive-in-outlook.html Not all versions of Outlook are created equal! Yep, Office Pro won’t cut it I’m afraid. I ran intothe same issue with another client and naturally assumed that Office Pro would be fine for archiving. Its not. You need Office Pro Plus 2010 or, stupidly enough, Outlook 2007 Pro. you can also use Outlook 2010 Stand alone. Great post! I think you could help us with our case. Recently, we started migrating our users to use the Online Archive but most of them are having issues with their Outlook search now. Their Outlook search function is just doing a partial search or not searching any items at all even the search has an expected result. When this first occur on their Outlook, we simply fixed the issue by rebuilding their index but after a couple of days the same issue returns. It makes sense that since Retention Policy move the emails from their mailbox going to their Personal Archive, the indexing were getting messed/reset on their local machines. Any suggestion or resolution for this issue? Outlook 2010 Std 32 bit. Does the search of the archive work properly with OWA? Contents of an archive are never included in the OST (cached local copy) so an online search is always performed. The movement of items into the archive should not cause a problem because the items are indexed as they are added to the archive (or removed from the content index if they are deleted). If Outlook is running in cached Exchange mode, it should use Windows Search (local) to search mailbox items and then go online for the archive. If Outlook is in online mode, it uses Exchange for everything. I did see http://social.technet.microsoft.com/Forums/en-US/exchange2010/thread/7b7e6ce7-1e77-4f56-bc06-fd4b51cc482c/, which recommended rebuilding the content index, but this would probably only help online clients. But in any case, to start the debug process, make sure that OWA can search the archive, then move on to an Outlook online client. Oh, sorry if I confused you Tony but the issue is with their local mailbox search. It only appears that this is somehow related to the Online Archive as the primary affected users are the ones that are already migrated to the Online Archive. Yes, the users are in Exchange cahced mode and we are able to fix the issue by rebuilding their indexes before but the same issue reoccurs after a couple of days. Any advise for this case? Thanks. Well, the archive items aren’t in the local cache so I can’t quite figure out why this could be affecting the issue. Have you considered running the OCAT (Outlook Configuration Analysis Tool) to see if it turns up anything strange with the configuration? Or logging a call with Microsoft Support? I guess since the emails from the the user’s mailbox were getting moved to the Online Archive, the indexing for the mailbox on the local machine were being reset. OCAT display some issue but we have set it up that way. I am using Exchange 2010 SP2 and I recently had to start exporting mailboxes to PST files for Human Resources. the size of one of the mailboxes was 424mb. When I exported it to a PST file the size of the file was almost 13GB and I’m not able to open it. Any idea why this would happen? The command I used was Get-MailboxExport Request. No idea. Very odd… Did you compare the mailbox contents with the PST to determine whether they matched? I ran the export command again. the PST file was only 427MB. Not sure what the problem was the first time. Very strange. thanks. Bottom line here when you migrate from Yellow software to Blue software – be prepared for a lot off what – this is not a standard functionality and we have to pay extra for this ??? Good one Tony. Recently I am testing Archiving feature; after I ran mailboxfolderassitant, it moved mails (older than 365 days) to archive mailbox. But inbox got cluttered with around 50 system messages; Any guidance on that why it happened & how I can tackle them. was deleted without being read on Friday, August 02, 2013 11:12:33 PM (UTC-08:00) Pacific Time (US & Canada). we are using outlook 2007 with Exchange Server 2010. We set a retention time of 2 years. For some reason the archive function didn’t worked well for 2 users. I have a user who as a folder structure from 2001 up to 2013. The Archive option only created a few folders. It skipped 2002, 2003, 2006. The folders that are created are empty or contains a few email. The original folder with the emails are also empty. I managed to restore the mailbox and checked the folders. The folder 2001 from the restore contains 651 emails. The archive folder has only 1 email. The policy is working fine for me. Nope. I can’t explain random behaviour in an installation that I know nothing about. I think you should create a support case with Microsoft and have them research the problem. The client really doesn’t affect the issue because it only displays the effect of the processing performed by the Managed Folder Assistant (MFA). The MFA interprets and puts the retention policy into effect, so the question is really what is in the policy and what has MFA done to those mailboxes? If possible, you could move the mailboxes to another Exchange 2010 database to force MRS to remove any lurking corruption (if any exists) in the mailbox and remove that from the equation. Request your help on this!!! – Are they all in the same database? – MFA has run for each mailbox, but has the FAI item that marks the “stamping” of the policy been created? Use MFCMAPI to look for an item of class of IPM.Configuration.MRM in the Associated Contents table of the Inbox. I have some really basic question and i am new on the Exchange 2010 SP3. We want to buy the CAL License to Enable the Archieving for some of really BIG Mailboxes. Do you have any Link where can i have the Info, which Cal License I need to buy!! Go talk to your local Microsoft office. They can explain what you need to buy and how much it will cost. I’m afraid I can’t help you. Good article – thank you! I helped a user set her archive policy on two computers (desktop and laptop) thinking if one client didn’t catch it, the other would. Backend is Office 365 with Outlook 2010. Now the user wants to remove the policy and NOT archive any future email. Do I need to reconfigure both clients to remove the archive policy or can it be done on the web browser interface and it will override the Outlook client settings? Are you using the client (Outlook) to archive messages to a PST or has a server-side Exchange retention policy been applied to the mailbox that includes a default archive retention tag to force archival of all messages older than a certain age to their archive mailbox? It sounds like the former. It’s the later – exchange server with archive mailbox enabled and an archive policy other than the default policy. User now wants to stop archiving at this time so I need to change the archive policy. I am unable to enable archive on a shared mailbox which was moved from onprem exchange recently and we have orphhened on prem exchange. Please suggest.